I’m passionate about living a healthy and green lifestyle, while being on a budget. 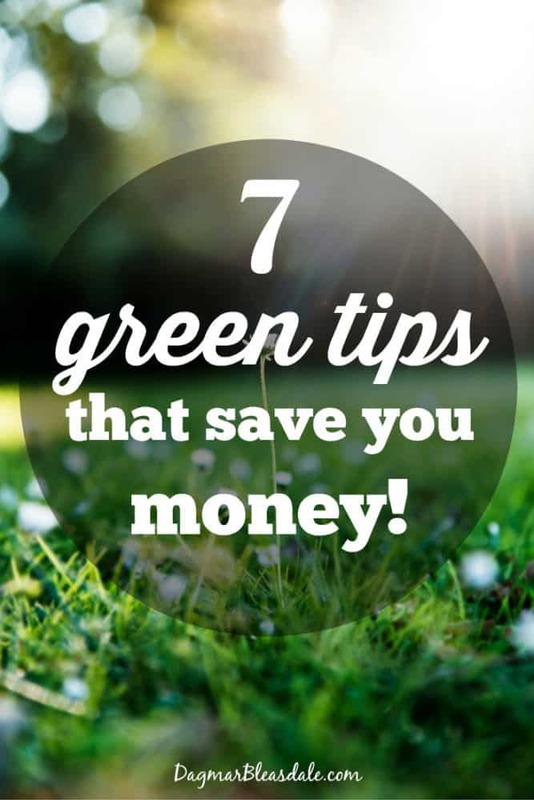 I want to share some tips with you on how I save money — and who doesn’t want to these days — while being kind to our environment. I remember that my mother always collected little boxes and toilet paper rolls while I grew up in Germany, and she would drop them off at our kindergarten when she had saved up a whole bag. We would use those materials for art and craft projects. Recycling is a big part of your live in Germany – we recycled materials into at least seven different bins. 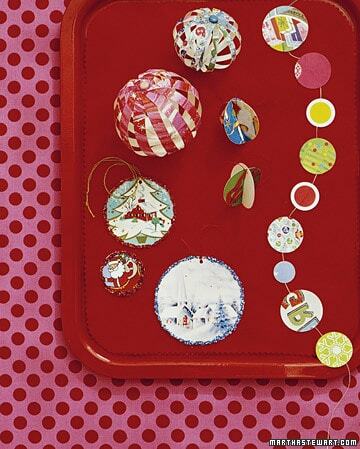 Recycle holiday cards, for example to make new ornaments like these. Landon is a little too young for elaborate art projects, but I have been saving cardboard and all kinds of things for his future craft projects. I have one designated box in the office for these supplies, and whenever I get another 50 address stickers from a charity that I will never use, or junk mail that includes a “Yes” sticker or a postcard with an animal on it, I throw those in that craft box. Oftentimes those address stickers have pretty little pictures on them, so I figure I just cut off the address part and Landon can sticker away. While he has fun making something for his German grandparents, Nani and Opa, I’m recycling paper and saving on art and craft supply costs. I reuse the sturdy plastic containers some restaurants give you for takeout and leftovers. I reuse them to store all kinds of small items, like Landon’s crayons or my office supplies. They also come in handy for DIY projects. 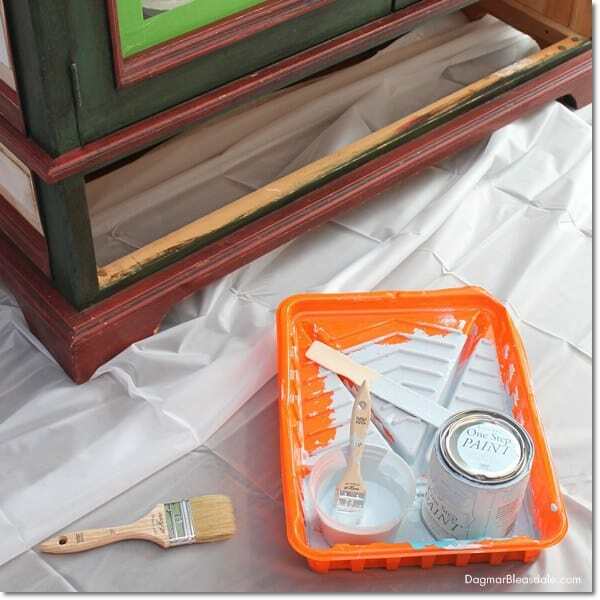 I like to reuse them for paint projects, as I did when I repainted this cabinet. Don gets the New York Times on the weekend, and I reuse the plastic bag around it if it is dry. I also save the extra plastic bags around bread. I don’t like to use expensive resealable bags for something that gets thrown out, so that’s what I save those plastic bags for. Once a month or so I go to our local dollar store and stock up on things that would cost me so much more at the supermarket. Find out where the biggest and most well-stocked dollar store is in your neighborhood — mine is in a mall. Things I buy: I love buying the toilet brushes with holder there because I like to replace them frequently, and for just a dollar (for both pieces) I don’t mind doing it. I also get dish sponges there, paper plates, birthday cards (10 for $1, how can you beat that! ), wrapping paper, gift bags, and resealable plastic bags. A few months ago I was really lucky to find cute finger puppets there for Landon. On my last trip, I got beautiful silk pillow covers there. They were so beautiful that I bought 10, in several colors, to update our home. If one gets soiled, I’m not too upset because I got them for such a bargain price. After last month’s $300 electric bill, I’m much more aware of the cost of energy-sucking appliances on standby. Before going to sleep, I now unplug the TV, shut down my computer, monitor, and printer. The more appliances you can unplug in your home, the better. This is also so much better for your sleep not to have all those waves going through your house all night. Besides, you can avoid shortening the battery life of your iPads and iPhones by making sure not to charge them all night. You can buy devices like this energy-saving outlet with timer that make it easier to save on energy. We are thinking of installing the Nest thermostat in our home, which also saves you energy costs and basically pays for itself. It automatically turns itself down when nobody’s home to help you save energy — brilliant! I just replaced many of our light bulbs with LED light bulbs. I have to admit that I’m not a fan of the light the ones I bought emit — it is a very harsh, and I put back the old bulb in the living room — but light bulbs have evolved so much in just the last few years, I just have to find the kind I like the best. I made a point to replace the light bulbs with LED in rooms I’m not in as much and the outside lights. Instead of throwing out old socks with a hole or T-shirt with a stain I can’t get out, I cut them up into smaller rags and used them to wipe the floor when I’m cleaning. I especially like using socks for this job: just put them over your hands, add some all-natural cleaner — my absolute favorite is Mrs. Meyer’s Geranium cleaner — and go! It’s a great way to get into tricky corners, and it saves paper towels. 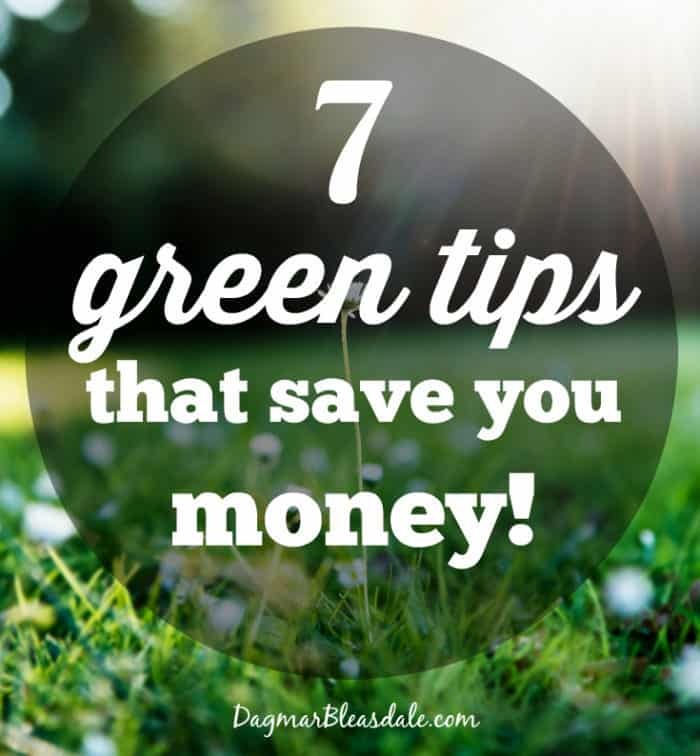 I hope these 7 tips on being frugal and green help you save money and make you feel great about saving precious resources. Great Article! I love the Dollar Store too. You had some good tips. Great post! I am a preschool teacher and I save all those things you mentioned in the beginning. I have even started asking my relatives and friends to save them. They think I am nuts, but these things are wonderful for crafting. 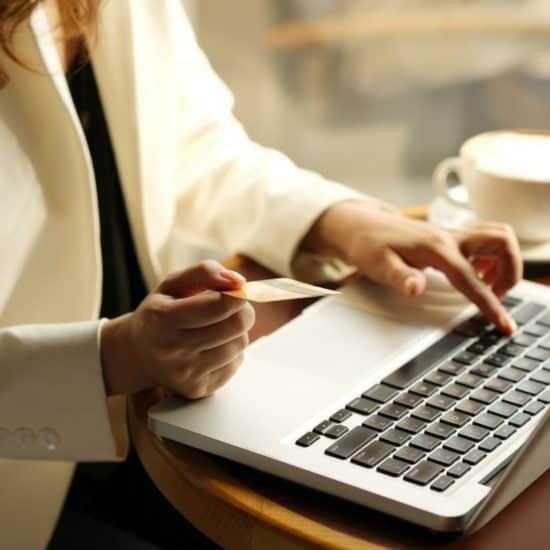 Come on over and visit me at Free 2 Be Frugal!